Inverness > A9 > Beauty Firth bridge > Cromarty Firth bridge > pass the turn off to Invergordon > pass the turn off to Portmohomack > Glen Morangie Distillery > Dornoch Firth Bridge > Golspie Pier > Golspie > Dunrobin Castle > Carn Liath > Brora > Helmsdale > Badbea > Badbea Historic Village and Clearance Centre > Dunbeath > right on A99 at Latheron > Lybster > Occumster > Blackness > Hill O’Many Stanes > Bruan > Whaligoe > Thrumpster > Wick > continue on the A99 > turn right on A99 at Reiss > Nybster > Freswick > turn right to Duncansby Head Lighthouse > John O’Groats > turn right onto the A836 towards Thurso > Mey > pass the Queen Elizabeth Castle of May > Dunnet > Dunnet Head Lighthouse > turn left before Castletown to go to Thurdistoft - we stayed overnight at the Thurdistoft Farmhouse. Airbnb - Thurdistoft Farmhouse, Thurdistoft. We booked this property while we were having breakfast the same day. What an amazing property. Imagine our surprise at having the whole place to ourselves. It came complete with 5 en-suited bedrooms, a formal sitting room, a business room, a gaming room with billiard table, dart-board, keyboard and board-games. It also had a full-size kitchen, laundry and dining room. George was an amazing host. We really want to stay here again and spend more time exploring the local area. Breakfast - Bacon and egg, sausage and egg rolls cooked by us in our accommodation. Lunch - Dram of Glenmorangie whisky (for the passenger), Werthers Original Butterscotch sweets/lollies. Dinner - Seaview Hotel on the way to Thirdistoft - Caithness Haddock with chips and vegetables. Beef steak pie and vegetables. Food was delicious, fast and affordable. We arrived at about 6:30 pm and were back on the road by 7 pm. After dinner - Drams of Old Pultney 12 year old whisky, Stroma Malt Whisky and Glenmorangie port wood finish Liqueur with Walkers shortbread biscuits. Complimentary with our accommodation. Thank you George! Day 2 was a big day. Google lied and said it would take 3 hours to drive 130 miles (210 km). Allow 4 - 4.5 hours to drive this stretch. With road conditions and about 6 hours of stops it took us 10.5 hours. We didn’t leave Inverness until about 10 am because we were on holiday, enjoyed our morning and knew that sunset was closer to 8 pm. We did a whisky distillery tour at Tomatin Distillery the year before so we were happy to do a self-guided tour around the property. 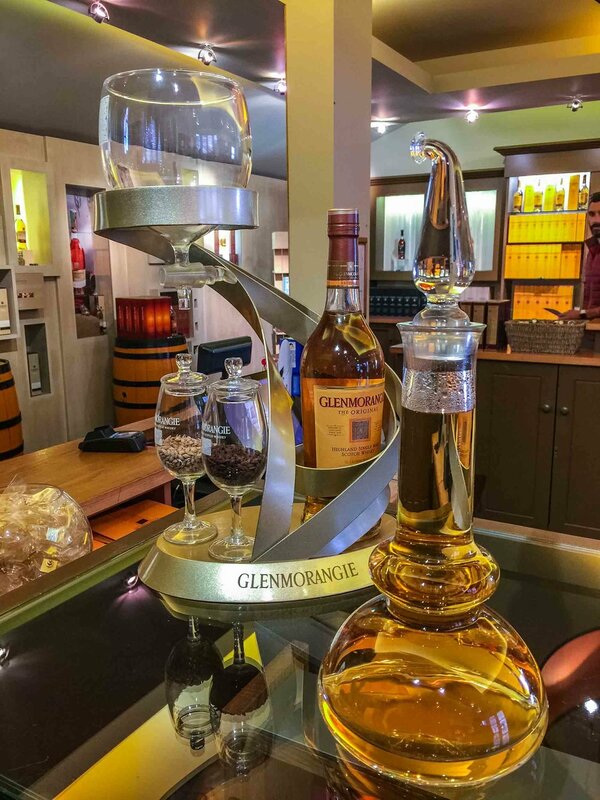 You can see the giraffe stills and read about the history of the distillery for free. We swapped driver’s today so I got to enjoy a dram. We bought our second bottle of whisky on our trip and hit the road again. Scott saw what was probably a Golden Eagle perched on a hay bale with fish in its beak near Invergordon. We saw lots of black and brown sheep and a variety of Highland Cows (they do come in colours other than orange). Just before Golspie village on your right (heading north) you’ll find the Golspie Pier. The old wooden pier lies in ruins beside it. You get a nice view of the surrounding coastline. Look for the 100 foot tall statue on top of Ben Bhraggie of the first Duke of Sutherland. Approaching Carn Liath, there are remnants of castles as well as the maintained castle of Dunrobin. After Dunrobin look out for the Carn Liath carpark on the left as it’s not well sign-posted. It was a short walk and we were standing on top of the ancient ruins of our first broch. 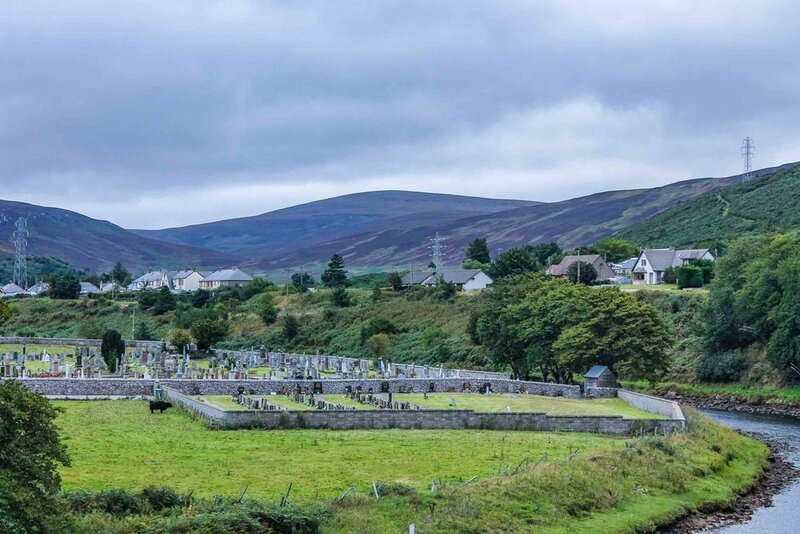 We drove slowly through Helmsdale on our way from Brora to Badbea Historic Village and Clearance Centre. There is an abundance of old stone-walls and walled cemeteries. We enjoyed 45 mins in the ruins of Badbea, one of the more remote Highland Clearance villages. The colour of the North Sea, with and without sunshine is a mesmerising steely blue. After Blackness there is a turn off to the left. Go past The Lemon Tree accommodation on your right. Continue up the hill. Just after the crest, slow down. You can park to your left near the gate. There is no formal parking area. We spent about 15 mins exploring more than 200 knee-high upright stones in 22 rows, wondering by whom and why they were placed there. About 1 minute drive after Hill O’Many Stanes there is a turn off for O’Brien Recycling on the left. This is nearly opposite the turn-off for the 330 Whaligoe Steps. Blink and you’ll miss it. We did. About 10 mins after the turn-off, we reached Thrumpster. This is the first sizeable village after the Whaligoe Steps. Keep reading Day 2: John O’Groats, Duncansby Head Lighthouse and Stacks, Thurso.